they are a wonderful history of this part of the West." moving to the mountains is all about." and to improve the world in light of that understanding...."
Dragons in Paradise: On the Edge Between Civilization and Sanity is a collection of essays by longtime Colorado mountain resident George Sibley, essays written over the past three decades for a variety of regional publications, including High Country News, Mountain Gazette and Colorado Central. Sibley sees the mountain towns of Colorado, not at all as "laid-back rural places," but as "post-urban" communities, increasingly populated by people with urban backgrounds who are looking beyond the city for more human and sustainable social and economic lifeways. He looks with humor and compassion on the inevitable tensions and conflicts between the residual "Old West" and this "New West" of which he is a sometimes reluctant part, and draws on his personal experiences to illustrate larger lessons about where American society might be, or could be, going. 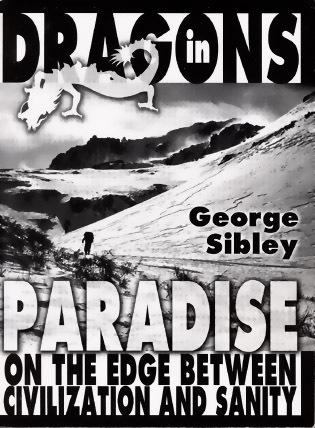 Whether looking at the ski industry from the perspective of a "paleotechnic ski patrolman," or at 20th-century capitalism from the perspective of a neo-hippie idea capitalist, or at the forbidding moral "wilderness" at the heart of modern society ("there be dragons"), Sibley will lead readers to a fresh new look at the world that lives in us as much as we live in it.